40 – passenger lounge coach – comes equipped with 28 forward-facing seats with extra leg room. There are also comfortable couches with side tables seating up to seven passengers, and a card table in the rear area of the coach which can accommodate up to five additional passengers. 16 – passenger sprinter bus – has luxurious reclining leather seats, individual reading lights, 110 volt plugs and USB chargers, as well as a large luggage compartment in the rear. 8-Sleeper Berth/48-Passenger Seated Coach – Some seats convert to bunks to accommodate eight sleeping passengers, with 32 forward-facing seats. Passengers can be entertained en route with DVD/CD Players and AM/FM stereo. Reversible seating with tables and our comfortable, reclining seats guarantee that every mile is ridden in luxury and comfort. Every motorcoach is equipped with a public address-system for your group leader to make announcements and comments about your trip or tour. At Beaver Bus Lines we prefer to purchase our vehicles brand new. By doing so, we know what our coaches’ history is. We maintain our vehicles in like-new condition. From our newest to the oldest, every coach receives the same excellent level of maintenance. Our equipment is among the finest in Canada. We are proud of our fleet and work hard to maintain a high level of repeat business through operating one of the cleanest, best maintained fleets anywhere. Our high standards ensure you are traveling on the safest bus on the road. Each vehicle receives preventive maintenance and is serviced at regular intervals. Vehicles are mechanically inspected by our maintenance staff before each multi-day trip. In addition, every bus is pre-trip inspected by the driver prior to picking you and your group up and after returning to the garage. All defects are recorded, reported, corrected and records are maintained in writing. Beaver Bus Lines buses have been treated with the antimicrobial MonoFoil. Bacteria and viruses are a major concern in today’s society. By treating our buses with MonoFoil we reduce the risk of such viruses and bacteria like the flu virus and staphylococcus among many others. MonoFoil provides continuous protection that does not promote genetic Adaptation by the organisms and that does not pose unnecessary risk to the ultimate organisms being protected…..US! When you choose Beaver Bus Lines you travel assured the bus has been thoroughly cleaned and regularly maintained. Our obsession with technical excellence is your guarantee of a trouble free trip to and from your destination. 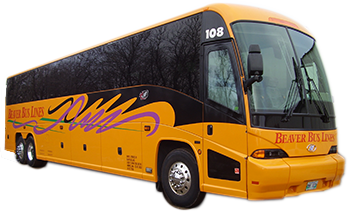 To retain its technical leadership and keep abreast of the latest industry developments, Beaver Bus Lines is an active member in the following associations: Motor Coach Canada (MCC),Ontario Motor Coach Association (OMCA) and International Motorcoach Group (IMG).